Masonry arches can add immense character to homes, both internally and when used as part of the architectural style of the building. For instance in the house under construction on the left, large arched windows follow the same shape as the arched entrance that will welcome those entering the home. But building any sort of arch, even one that forms part of a garden plan, needs to be undertaken with great care, particularly if it is to span a wide opening. 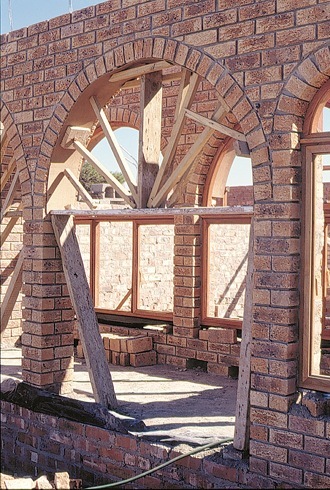 The most widely accepted method of building arches is to use a supporting formwork that is cut in the shape of a semicircle, or to use hardboard (that you can see lining the inner surface at the top of the arch above) that is kept in place with battens cut to length. 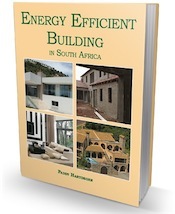 In South Africa, the construction of masonry arches is contained in Part K, Walls of SANS 10400, which is, of course, a “deemed to satisfy” part of the National Building Regulations and National Standards Act. Essentially, any circular masonry arch that has a span not exceeding 2,5 m must have an arch ring depth and proportions that meet the standards shown in the drawing below. Of course the walls that form the lower part of the arch must also be built in accordance with the Standard. The Standard doesn’t give a lot of guidance, but it does say that the rise must be between 0,3 and 0,5 times the span of the arch. It also states that masonry units should be solid and that the arch ring should be constructed in either a header or a stretch pattern. The depth of the arch ring should be no less than 200 mm where the rise is between half and two-thirds of the radius. It should be no less than 300 mm if the rise is greater than two thirds, but less than – or equal to – the radius. So a bit of basic mathematics is required here. The guidelines given in the NHBRC handbooks is basically the same as in the SANS. Hi, any information regarding the photovoltaic solar panels, are they as effective as installing the electricity? Hi, my veranda is flat and need a concrete roof, any ideas or guidelines to the type of material needed, the area is 2500m X 3500m. thank u in advance. We discuss concrete roofs on this page – link supplied. Hi, any guidelines for installing the rotating cowl, I need it for the completion of my wood fireplace installation. thank u in advance. Javas, Cowls are not covered by the space heating SANS in 10400. Jetmaster make them and will be able to supply installation guidelines for their products. My book How to Weld the Easy Way – available in ebook form from the link provided, has instruction on how to make a fireplace and a cowl.